Guided Mark-Up: AP Pelvis Measurements - Website of metron-md! 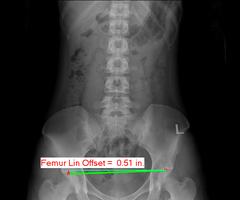 Femur Linear Offset: This is the difference in vertical height between the tops of the femur heads. Femur Angular Ofset: This is the angle that the line connecting the tops of the femur heads makes with a horizontal. Illium Linear Offset: This is the difference in vertical height between the tops of the Ilium. Illium Angular Ofset: This is the angle that the line connecting the tops of the left and right Ilium makes with a horizontal. Sacral Base Angle: This is the angle made by the base of the sacrum relative to the horizontal. L5 Angle: This is the angle made by the base of L5 relative to the horizontal. Symphsis-L5 Offset: This is the horizontal offset from the center of the L5 body to the center of the symphsis. Pelvis Width: This is the distance between the tops of the femur heads.